Rocky Mountain ATV/MC-KTM’s Davi Millsaps came in a bit under the radar this year with other storylines dominating the preseason talk, but his solid start to the season has once again changed all of that. We’ve covered his career since amateurs and always enjoy catching up with our former southern neighbor. The AutoTrader.com/ Monster Energy/JGR Suzuki team would prefer to hit the reset button on 2017 after injuries have already claimed their top 450 riders before the series hits February. Weston was looking great on the new bike before an unfortunate practice crash at Glendale resulted in a dislocated wrist and lacerated kidney. We’ll get the latest from the Viking tonight on his recovery and timetable for return. Brett Smith is a celebrated journalist in motocross and we appreciate his objective opinions and perspective on racing and the stories that surround it. 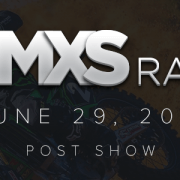 DMXS Radio thanks Coach Robb Beams, Troy Lee Designs, Moto Dynasty, SCOTT, Shades of Gray, Racer X, MX Sports, DUBYA Wheels, GoPro, OGIO, Concept2 Rowers, Skull Candy, and Stellar MX Graphics for their continued support. DMXS Radio has been making Bad Billy proud since 2001!